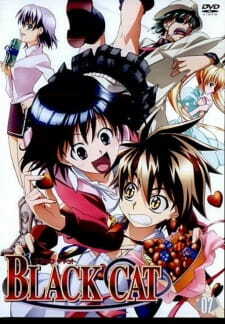 Black Cat DVD only episode. I'm writing a review because there doesn't seem to be one for this one episode that is usually bunched up with the anime when you download it. This comes off as quite confusing because it tries to tell you what was going on during certain parts of the main story while trying to be separate at the same time. It just kept switching to different parts to explain things, but at that point? I didn't care because the story was so far along in the main series that it shouldn't matter anymore unless you really think it was plotholes. That's what this anime seems like a plothole anime. I feel this episode should have been somewhere in the middle. The answers you are looking for for plotholes in the anime are explained in this episode, but it's a little....pointless? I don't know. As hard as it might be to find, or even notice, many viewers get to watching this without even batting an eye, thinking it was an episode from the main show. “Black Cat: Tooza karu neko” or “Black Cat: The Distant Cat”, and sometimes called Black Cat episode 14.5. Remember that the anime has 23 official episodes, not 24, so in case you're watching your fair share of 24 episodes of “Black Cat”, you will have to note that the 15th episode would be this one. The change in storytelling they had in this episode, linking parallel events as they progress surprisingly worked really good here. You can tell that the purpose was to justify a number of plot points a clear out many mysterious relationships between several characters, which the spotlights being on Train and Sephiria giving us glimpse of how they both met, and what kind of person each one of them sees the other. In the context of the story, it didn't do any great deeds really, but it was nice seeing more of Train's past, how he completed his first mission and how he transformed to the ice cold killer we all have come to know. You could have already watched this without even realizing as I said before, but in case you haven't, it wouldn't hurt to see it.